As with any good multiple point of view story, the reader sees how the characters are connected in ways the characters themselves never will. And even with all these distant connections, few characters are connected to the people they are closest to or even to themselves. Several tourists refer to Fallingwater as “the House,” a proper noun, making it a character of its own. But we return most to Liliane, who is trapped in a marriage to her cousin Edgar. And though this marriage was a business transaction for the family and the store, Liliane is not trapped by her lack of love as we might expect. She’s trapped by her overwhelming love of Edgar, a husband she can never fully have. 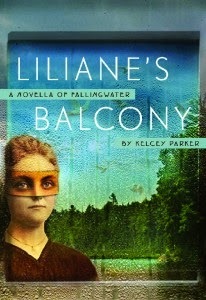 Though he is never faithful, his affair with his nurse is the last straw and leads Liliane to suicide on the balcony of her room. And this is where the novella starts. Much of novella then pieces together what brought her to this death. Most crushing are Edgar’s assurances that he loves Liliane more each day, even though he readily admits it is not a faithful or physical love. He urges her to be happy in letters and writes, “For when I get back, never anything in your face but a smile, so practice now for me, my love.” And his “Love the kind you long for,” becomes the refrain of their story. We see a life of trying to matter in other ways. We see what becomes commonplace and what is too much to bear in a situation already too much to bear. Though weary from it, Liliane comes to expect and endure Edgar’s infidelities. In fact, she is more upset when he spends a large amount of money on his latest mistress at a rival department store. We get very little from Edgar besides his letters, which I was pleased to discover are real excerpts. But while Parker spends the majority of the novella imagining Liliane’s struggle, she wisely leaves us to diagnose Edgar. A tragic story needs its breaks, and Parker gives us ample humor through tourists like Josiah Quimby, “a man of high culture and Harley-Davidsons,” and The Daughter who judges everyone using a high-school-level Spanglish and is convinced that, "someone in their group is la ghost." Parker has a knack for perfect details, like when the out-of-sorts Amanda cannot make sense of a scrolling bank sign that reads, “ARE YOUR – HOMETOWN SAVINGS – BANK 88F – LOW INTEREST – RATES THURSDAY – JULY 1 – 12:21PM WE.” And Parker incorporates many other jewels from history, including writings from Frank Lloyd Wright and a visit from Frida Kahlo that made me itch to get to the Author’s Note.